Lady Cuddles is perfectly pink, with the softest, most beautiful cuddly pink fur you’ve ever felt. She is a huge stuffed bear with a big soft head and body just perfect for cuddling.Lady is a Giant Teddy brand bear, and you’ll fall in love with her sweet teddy bear face. She has a velvety-soft black nose, dark brown eyes, and comes wearing a detachable brown and white checked scarf. Lady Cuddles has appeared on the Emmy Award-winning ABC comedy, “Modern Family,” and has a star on our Giant Teddy Bear Paw Walk of Fame. 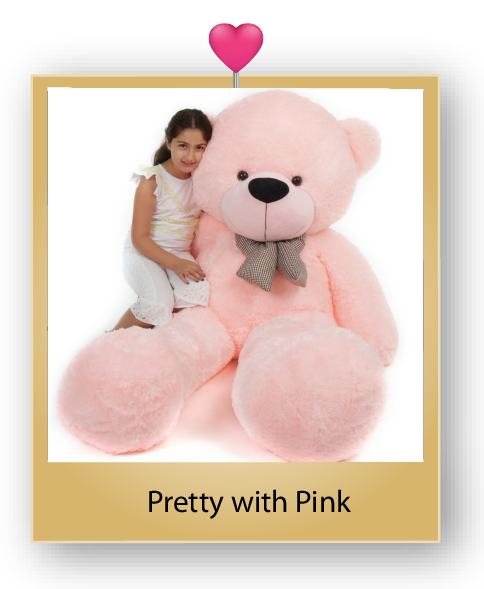 She will make an impressively pink and adorable gift for a lucky someone in your life! Giant Teddy brand bears are all stuffed with love using only new, lightweight, non-recycled materials that meet or exceed all US Safety standards. Our bears are safe for all ages, and each one passes our own Cute & Cuddly Hug Test before going on to their Forever Bear Homes.